I was cycling down Iron Bridge Road a few weeks ago and spotted, what looked like, marshals for some sort of event. As I approached I saw they were promoting Sustrans. I stopped to chat and discovered some things I didn’t know. I knew they were involved in developing the Taff Trail and always thought they were a government organisation. They are in fact, “A charity that works with communities, policy-makers and partner organisations so that people can choose healthier, cleaner and cheaper journeys and enjoy better, safer spaces to live in”. 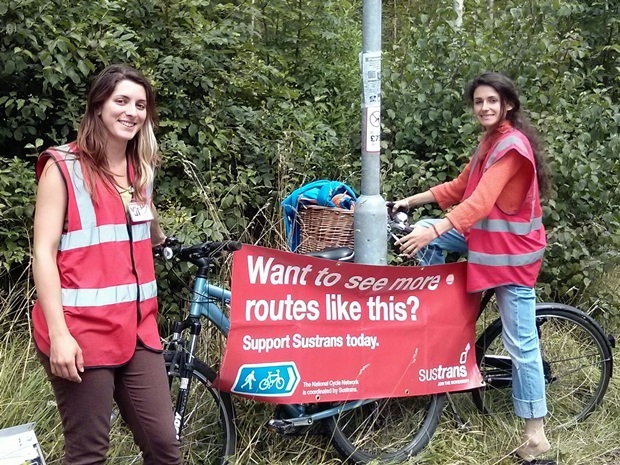 Sustrans Cymru focus on Wales and have lots of information covering health, communities, policy and many other areas. They are currently involved in campaigning for the Active Travel Bill. You can follow them on Twitter, sign up for their newsletter or help to support them. Hi, the Taff Trail was set up in partnership by all the local authorities along the route and coordinated by Groundwork Merthyr & Rhondda Cynon Taff. It was later adopted as part of the National Cycle Network which was when Sustrans got involved.